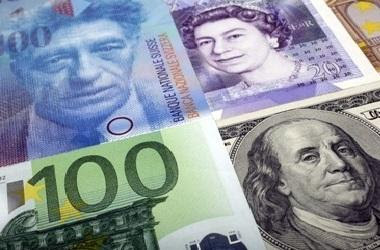 The US dollar advanced against most of the major currencies last week, with Brexit hopes on the upswing, helping sterling the only major currency to resist the pressure. If players were looking for an excuse to sell dollar the disappointing September jobs growth could have been it, but the bout of buying the rumor and selling the fact was quickly exhausted. Several of the currency pairs we review look stretched as do oil and the 10-year yields. The technical readings can make for treacherous conditions. Be on the lookout for reversals. Dollar Index: The longest streak in five months (six consecutive sessions) ended with the losses in the last two sessions of last week. In this leg up began in from around a three-month low in the third week of September with the Dollar Index near 93.80. It pushed through 96.10, which was above the upper Bollinger Band, before what appears to be the limited profit-taking kicked-in. The MACD and Slow Stochastics are still moving higher. A break of the post-jobs data low near 95.50 would be disappointing, but additional support is seen in the 95.15-95.25 area. On the upside, the August 15 high near 97.00 is the next major objective. Euro: The euro's latest push lower after the bull trap was sprung above $1.18 does not look over. The technical indicators are consistent with lower prices. There is a large option (1.3 bln euros) at $1.1450 that expires at the start of the new week. Reports in a local paper say the German economy ministry will cut this year's GDP forecast to 1.8% from 2.3% and to 2% in 2019 in the coming day. If true, it does the euro no favors. However, it has already come a long way in a short period. It has fallen in nine of the past eleven sessions. We do not expect a push much below $1.1450 will be sustained quite yet. On the upside, it may take a move back above $1.1600 to turn the technical tide. Sterling: After briefly trading below a trendline connecting the August and September low (~$1.2935-$1.2945), sterling bounced strongly to make new highs for the week ahead of the weekend (~$1.3125). Prime Minister May remains unchallenged as leader of the Conservatives and is reportedly prepared to make some additional compromises and EC officials still make it seem that progress is being made toward an agreement. The technical indicators are mixed, but on balance, a move toward $1.3200 should not surprise. This too implies additional euro losses on the cross. The euro, which peaked near GBP0.9100 in late August, slipped through GBP0.8800 before the weekend to see its lowest level in four months. There is scope for another one percent for the euro against sterling. Canadian Dollar: The US dollar trended lower against the Canadian dollar throughout the third quarter. It began the fourth quarter with a gap lower opening on the NAFTA 2.0 deal. That gap appears to have been an exhaustion gap, marking the end of a move rather than an acceleration. Even news before the weekend of Canada's first monthly trade surplus since December 2016 was unable to stem the decline of the Canadian dollar (and dollar-bloc currencies). The technical indicators have not decisively turned in favor of the US dollar, but they seem poised. The 100-day moving average near CAD1.3055 and may be a reasonable near-term target. We note that the two-year rate differential trended in the Canadian dollar's favor in the first half of Q3, but it has been moving back in the greenback's favor since late August. It dipped in mid-September but is widening again. Australian dollar: The Australian dollar had its worst week in nearly two years, falling nearly 2.5%. It is at near 2.5-year lows and settled poorly. Domestic concerns (especially the housing market) and the international climate (China slowing, US raising rates, trade tensions, commodity prices) are powerful drags. The double top from Q4 17 and Q1 18 around $0.8130 has a measuring objective of about $0.6900, and the Aussie is steadily making headway toward it. While the technical indicators allow for additional losses, it looks over-extended straddling the lower Bollinger Band. A weak opening may be a bear-trap. Oil: After peaking just shy of $77 in the middle of last week, the price of light sweet crude for November delivery pulled back to $75.20 before the weekend. This is more or less at the three-week uptrend line. The main driver seems to be that the US embargo against Iranian oil is going to be more effective than expected and that neither Russia nor OPEC have either the capacity or desire to offset the loss. The technical indicators are stretched and appear set to turn lower. A shallow correction risks $71.50-$72.00. US 10-year: Around three weeks after breaking above the 3.0% mark, the US 10-year Treasury yield is approaching 3.25%. The yield rose 17 bp last week and a 37 bp adjustment since the end of August. The technical indicators of the futures contract are stretched though haven't turned. However, with two successive closes below the lower Bollinger Band, it seems a risky time chase the market. The rising 10-year yield is only part of the story. The yield curve is experiencing a bearish steepening. The bearish is that debt prices are falling at both ends of the curve. The two-year yield rose a little more than six basis points. The 2-10 curve steepened 10 bp to 34 bp last week. It is the highest weekly close since June. S&P 500: The S&P 500 fell for the second consecutive week. This is the first time the US benchmark has fallen back-back weeks since the end of June. The pullback was a story of the second half of the week when in the last two sessions, it retreated by around 1.5% to dip below the 50-day moving average for the first time since July 5. With stocks near record highs still and US 10-year yield at its highest level in seven years, it is hard to argue that the two cannot move higher together. At the same time, structurally remember that US corporates are net savers. In fact, it was the cash-rich technology sector that seemed to lead the move lower. Financials are an obvious beneficiary of higher rates and a steeper curve.